Animated path of entire Saros. 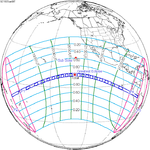 An artist's depiction of the total solar eclipse of May 6, 1883, observed from Caroline Atoll, Line Islands. 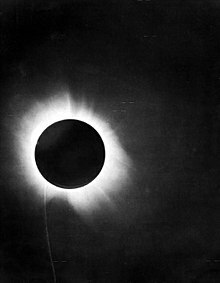 The total solar eclipse of May 29, 1919, observed from the island of Principe. Positions of star images within the field near the Sun were used to verify Albert Einstein's prediction of the bending of light around the Sun from his general theory of relativity. 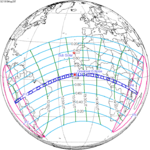 Total solar eclipse of July 11, 1991 from Costa Rica. 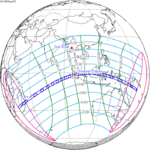 Total solar eclipse of July 22, 2009 from Bangladesh. 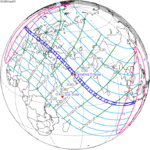 Solar Saros 136 is for now producing the longest total solar eclipses. 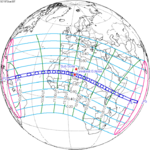 It produced the six longest total solar eclipses of the 20th century, three of them over seven minutes long. 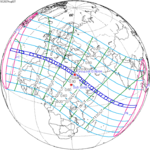 It also produced the longest total eclipse of the 21st century at 6 min 39 sec, and overall will produce the century's three longest total eclipses. 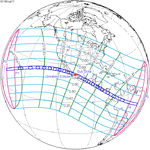 Each eclipse is getting slightly shorter and this series will be surpassed in total eclipse length by Solar Saros 139 (whose eclipses are getting slightly longer) on May 11, 2078. 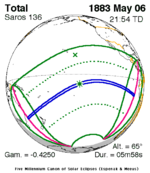 Saros 136 will ultimately produce a total of 44 total eclipses. 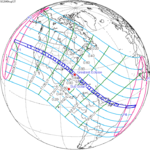 It produced the most central total eclipse between the years 1209 and 2718 and the greatest magnitude of any eclipse since the year 540 on July 11, 1991. Solar Saros 136 repeats every 18 years, 11 days, 8 hours. Solar Saros 136 contains 71 events in which of 15 will be partial eclipses and 56 will be umbral eclipses (6 annular, 6 hybrid, 44 total).